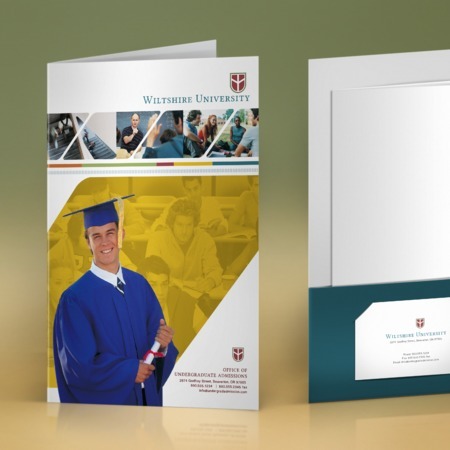 Create big impressions with custom mini folders! These are great as restaurant and service menus, point of sale and product brochures, handouts, instruction manuals and price lists. These pocket folders are also great marketing tools for your business. You can use them as marketing kits for your flyers, sales sheets, and introductory letters. Make your folders look professional to create a good impression to yout potential customers. UPrinting offers quality folder printing for your business needs. You can also choose between matte and gloss finish for a more professional look for your folders. You also have an option to have single or double pockets for your mini folders. Order from 100 up to 10, 000 pieces and have the printed in 4 to 6 business days. Just navigate our calculator and upload your file to place an order. If you have questions or concerns about your order, feel free to contact us at 1.888.888.4211 and one of our customer service representatives will be happy to assist you!